It has been seven long years that I have been a chore slave momma. I have been serving a family of five and every single minute I spend doing chores is just as precious as what I have to spend with them. Time is gold. I have a confession. If there is one thing that I hate doing is washing the dishes. I could stand all day washing clothes but bot dishes. Why? I grew up washing dishes over and over again because of the non stop grease that won't come off with our dishwashing soap. Imagine, I had to use a bar of detergent to wash dishes? Doesn't sound good right? But when I became a mom, I had to love what I hated. It comes with it. I had to love washing dishes especially that I love preparing meals and cooking for the family. But in this new generation, there are new products that will save your sanity, just like mine. What made me love doing chores is the gears and products I use to be able to accomplish them. I was sent Bubble Man Dishwashing liquid few weeks ago. I had to try it in all sorts of residue before I could make a review about it. So what are my thoughts? I just love that it removes residues from all my ceramic pans, my plastic wares, China wares, spoon and forks, and all kitchen utensils. I have tried it also with my stainless stove as well as my kitchen tiles and my stainless sink. What I love about it is with only one drop, I could wash about 4 plates, 4 glasses and 4 sets of spoon and fork in one setting. I use one drop also for cleaning all the kitchen sink as well as cleaning the stove and our table. It removes the residue perfectly without having to redo it and removes the stink because of its scent. But note though that it doesn't leave bothersome smell even after drying the kitchen utensils. It is also non-drying despite having to wash alot of dishes all day everyday of my life. Plus my hands smells good also. The dishwashing soap is free from SODIUM HYDROXIDE and PHOSPHATE that is why it is safe for our skin. Why do I use them as all around kitchen product? So that I would know how far it could go when it comes to cleaning. I could also use on product for the entire kitchen instead of buying too much products that will become a clutter later on. Saves me money and a lot of effort plus sanity! The time I save from washing dishes and cleaning the entire kitchen is the time I spend with the demanding kids. Who wouldn't love a product such as this? The best part of it is Bubble Man Dishwashing liquid is a local product and is already available at your nearest grocery stores. Bubble Man Dishwashing liquid comes in three variants; Kalamansi, Antibac and Lemon. My personal favorite is the Kalamansi. Availability: It is already available in your nearest grocery stores nationwide. 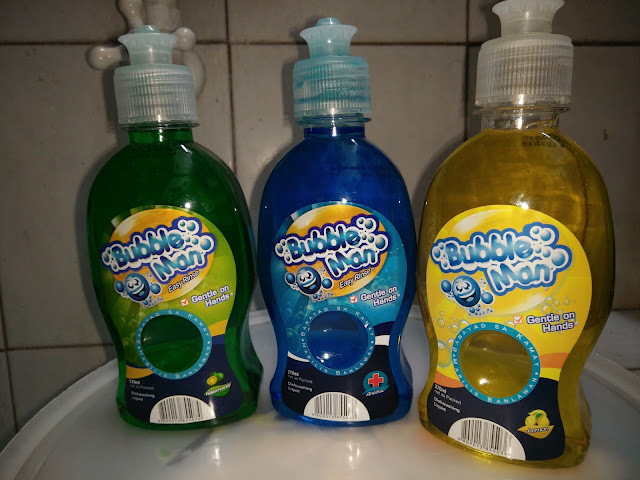 Bubble Man Dishwashing liquid is a product of Mikewell World of Household Products, Inc.
Disclaimer: The products were sent to me for review but all my opinions and thoughts in this blogpost is written honestly.